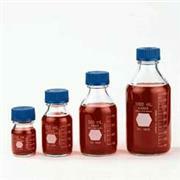 Manufactured from TPCh260 without colorants or pigments. 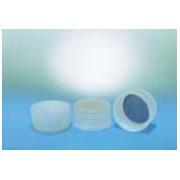 Silicone liner has double faced PTFE for highest chemical resistance. Temperature range: -196C to +260C. 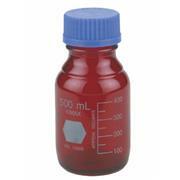 PTFE threaded pour spout with fetfe o-ring prevents material contact with the threads. 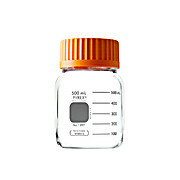 Screw cap graduated bottles can be dry heat sterilized to 180°C when used with optional Melamine resin caps 1743E90 and ETFE pouring rings 1743E95. 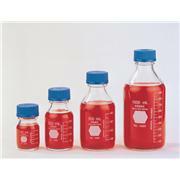 …resistant and stable laboratory bottles, approved for use vacuum or pressure. rated at -1 to +1.5 bar, (-14.5 to +21.7PSI). 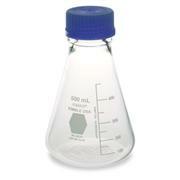 Bottle only with blue graduations, without cap or pour ring. For cap and ring see 7622. 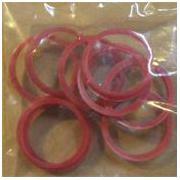 Available clear, amber or plastic coated. 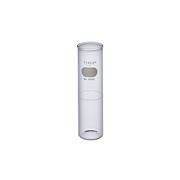 Temperature range up to 140° Deg C.
…is permanent white enamel. 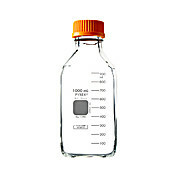 This general use bottle is provided with a wide opening (approx. 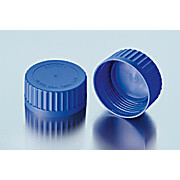 30 mm ID) GL 45 screw thread and is supplied with linerless autoclavable (121 ºC max) polypropylene blue cap. 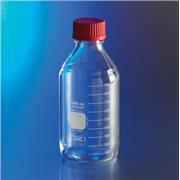 Bottle design includes a clear (natural) drip-free polypropylene pour ring which is replaceable. 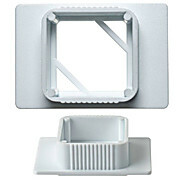 …for protection against mechanical damage and to prevent leakage of contents should the glass break. 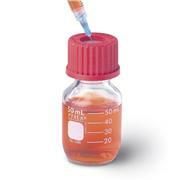 Supplied graduated with red plastic cap and removable pouring ring that allows drip-free operation. 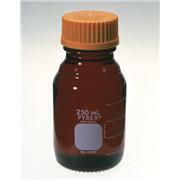 Cap has PTFE liner.Not suitable for vacuum or pressure use. 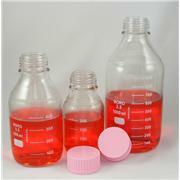 Can be hot air sterilized or autoclaved. 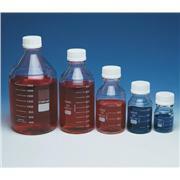 These KimCote® plastic-coated Erlenmeyer Flasks have large openings, GL 45 thread closures to make filling easier and provide tight seals during storage. 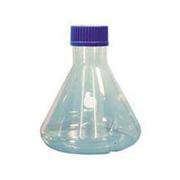 Flasks come with blue polypropylene caps and clear pour rings. 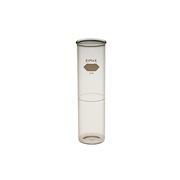 Marking spots and scales are durable white ceramic enamel. …transporting light sensitive materials. 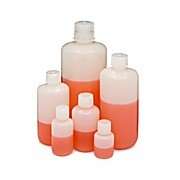 Bottle includes a linerless, one-piece autoclavable, orange polypropylene plug seal cap with drip-free pouring rings. Glass beads indicate full capacity line. Permanent white enamel graduations and marking spots. 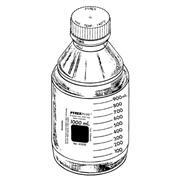 Thread size is GL45 and neck ID is 29 mm. 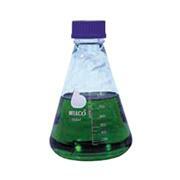 …and resistant to thermal shock. 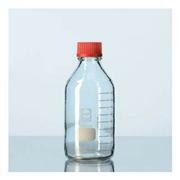 Bottle comes complete with autoclavable, one-piece, teal colored, polypropylene plug seal cap with drip-free pouring ring. Glass bead indicates full capacity line. 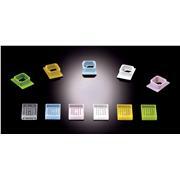 Teal enameled graduations and marking spot. Thread size: GL45. Neck opening: 29mm I.D. 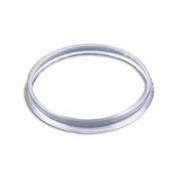 …thermal shock resistance; usable up to 500°C and in microwave ovens. 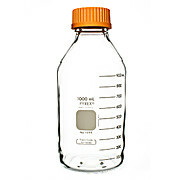 Cap features include a linerless, one-piece autoclavable orange polypropylene plug seal GL80 threaded cap with a drip-free pouring ring, easy on-off quick release and an audible click when cap is sealed on the bottle.